^ Nyquist, L. E.; Wiesmann, H.; Shih, C.-Y. ; Dasch, J. (1999). “Lunar Meteorites and the Lunar Crustal SR and Nd Isotopic Compositions”. Lunar and Planetary Science 27: 971. Bibcode: 1996LPI....27..971N. ^ Borg, Lars; et al. (1999). “The Age of the Carbonates in Martian Meteorite ALH84001”. Science 286 (5437): 90–94. doi:10.1126/science.286.5437.90. ^ McKay, David S.; et al. (1996). 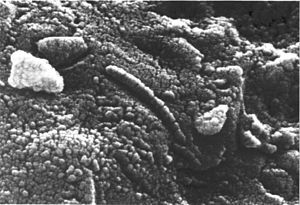 “Search for Past Life on Mars: Possible Relic Biogenic Activity in Martian Meteorite ALH84001”. Science 273 (5277): 924–930. doi:10.1126/science.273.5277.924.